Kuhnke electronics products centre on small and mid-range PLC's which can be integrated into manufacturing automation systems. 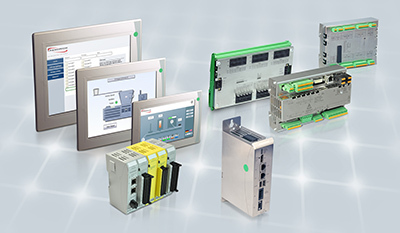 Kuhnke support PROFIBUS DP, CANopen and AS-Interface networks, with products described in more detail on this site. Kuhnke's total electronics package extends to dialogue terminals (HMI's or MMI's), position controllers and drives. Kuhnke specialise in integrating standard catalogue products in systems and customer specific products, a facility popular with machine builders. A very big part of Kuhnke's service is engineering solutions to meet unusual and exacting applications. These pages are an introduction and overview to Kuhnke Electronics Products. More information on current products can be found on the Kendrion Kuhnke web site by clicking HERE.